In 2011, researchers observed something that should be impossible—a massive bloom of phytoplankton growing under Arctic sea ice in conditions that should have been far too dark for anything requiring photosynthesis to survive. So, how was this bloom possible? Using mathematical modeling, researchers from the Harvard John A. Paulson School of Engineering and Applied Sciences (SEAS) found that thinning Arctic sea ice may be responsible for these blooms and more blooms in the future, potentially causing significant disruption in the Arctic food chain. The research is described in Science Advances and is a collaboration between researchers from SEAS, University of Oxford and University of Reading. Phytoplankton underpins the entire Arctic food web. Every summer, when the sea ice retreats, sunlight hitting the open water triggers a massive bloom of plankton. These plumes attract fish, which attract larger predators and provides food for indigenous communities living in the Arctic. Phytoplankton shouldn't be able to grow under the ice because ice reflects most sunlight light back into space, blocking it from reaching the water below. 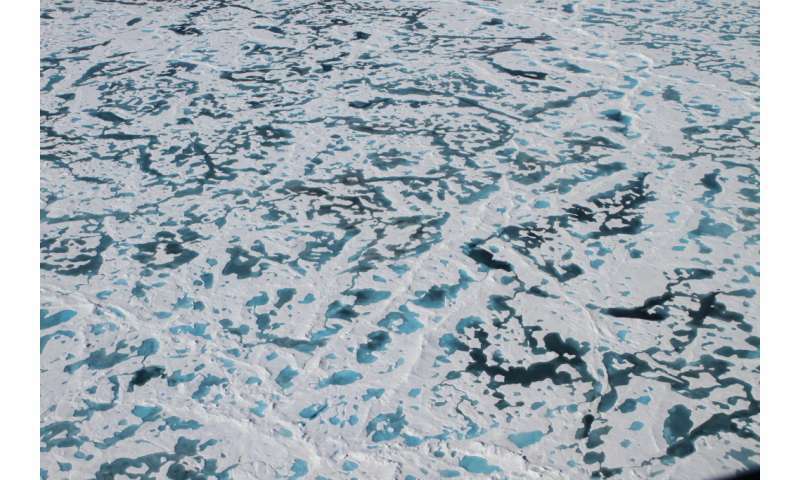 But over the past decades, Arctic ice has gotten darker and thinner due to warming temperatures, allowing more and more sunlight to penetrate to the water beneath. Large, dark pools of water on the surface of the ice, known as melt ponds, have increased, lowering the reflectivity of the ice. The ice that remains frozen is thin and getting thinner. "Our big question was, how much sunlight gets transmitted through the sea ice, both as a function of thickness, which has been decreasing, and the melt pond percentage, which has been increasing," said Chris Horvat, first author of the paper and graduate student in applied mathematics at SEAS. "What we found was that we went from a state where there wasn't any potential for plankton blooms to massive regions of the Arctic being susceptible to these types of growth." The team's mathematical modeling found that while the melt ponds contribute to conditions friendly to blooms, the biggest culprit is ice thickness. Twenty years ago, only about 3 to 4 percent of Arctic sea ice was thin enough to allow large colonies of plankton to bloom underneath. Today, the researchers found that nearly 30 percent of the ice-covered Arctic Ocean permits sub-ice blooms in summer months. "The meter decline in sea ice thickness in the Arctic in the past 30 years has dramatically changed the ecology in that area," said Horvat. "All of a sudden, our entire idea about how this ecosystem works is different. The foundation of the Arctic food web is now growing at a different time and in places that are less accessible to animals that need oxygen." The researchers hope their model will be helpful for planning future expeditions to observe these blooms and measuring the impact this shift will have on ecosystems. It is nice to see scientists admitting they see things that should not exist. Good first step is to admit you may be wrong. Are they saying there is no oxygen in the water under the ice?!? WG: Less accessible, because the ice on top limits the air-water gas exchange, compared to open water blooms. Therefore less oxygen, but more than none.